Located just 4 short miles north of downtown Indy, the historic Indianapolis homes of Meridian Kessler are among the city's most beautiful and sought-after real estate. Tree-lined streets and stately residences are the hallmark of the Meridian Kessler area, which includes the Indiana Governor's Mansion. 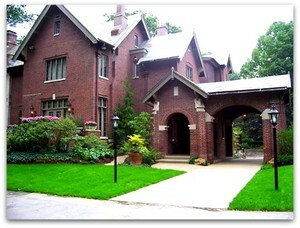 One of the most presitigious addresses in all of Indianapolis during the 1920s, Meridian Kessler remains an affluent and and extremely desirable Indianapolis neighborhood. Named for famous landscape architect George Kessler, the early Meridian Kessler neighborhood of the late 1890s was more a smattering of country estates than the urban outskirts community it is today. After the city of Indianapolis annexed Meridian Street from 38th Street (formerly Maple Road) up to the town of Broad Ripple in 1905, infrastructure improvements in the area encouraged residential development, and soon Meridian Kessler was a wealthy and booming suburb. Although many grand homes were built along Meridian Street, Pennsylvania Street, and Washington Boulevard, smaller but equally impressive middle class homes also became part of the landscape. That translates into good news for today's buyers, since Meridian Kessler homes cover a broad price range. A drive down Meridian Street between the neighborhood's north and south borders of Kessler Boulevard and 38th Street is guaranteed to impress Indianapolis residents and visitors alike. as they're reminded of a bygone era in a thriving area! The annual Meridian-Kessler Home and Garden Tour is generally held in the spring, and offers a great opportunity for the public to get a glimpse of the unique charm of these Indianapolis homes. Location: North Indianapolis, bounded by Kessler Boulevard to the north, 38th Street to the south, the Monon Trail on the east, and Meridian Street on the west.